Machu Picchu is often referred to as the “Lost City of the Incas” and is one of the New Seven Wonders of the World. It is a breath-taking 15th-century Inca citaldel located over 7,900 feet (2,430 meters) in the Peruvian mountains. It’s also one of South America’s most spectacular tourist destimations. How do you visit a place like this? It’s not like you can hop on a flight and book a quick tour. The closest major airport near Machu Picchu is Alejandro Velasco Astete International Airport (CUZ) located in Cuzco, Peru, which is about 46 miles (75km) away. This airport is the second busiest in Peru and serves over 2 million passengers a year. 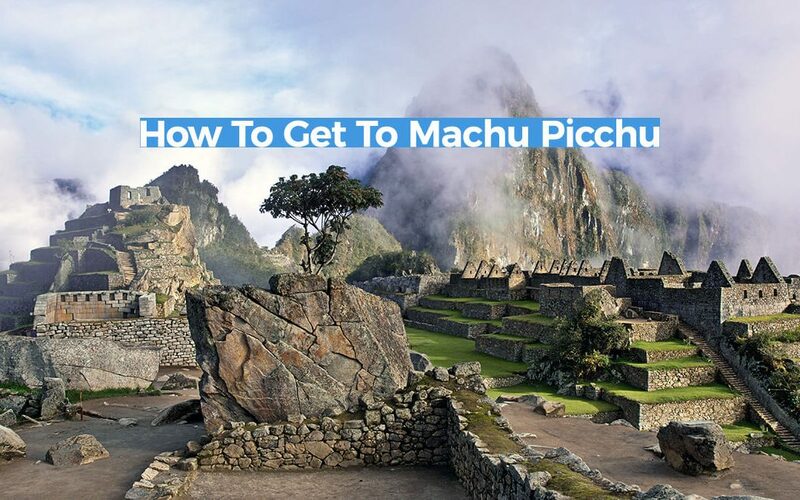 Once you arrive to Cuzco, you’ll need to purchase tickets to Machu Picchu. While you can book online in advance, it’s best to wait until you arrive as you’re likely to get a much better deal. Be sure to bring cash too as most places don’t accept card. Upon arrival, you’ll likely be solicited for transport help and tickets. Sometimes they can even be priced quite fairly. There are many hostel and hotel options in Cuzco. They can be booked in advance or on arrival (depending if it’s the busy season which is in July and August). Alternatively, there are also quite a few places to stay in Aguas Calientes. Seeing as Machu Picchu isn’t in Cuzco, you’ll need to get to Machu Picchu Pueblo (also known as Aguas Calientes). The best way here is to hop on the train. Your hotel can arrange for train tickets, though it’s best to book far in advance as many tour agencies tend to pre-book and block seats. To take the train, you’ll need to make your way to Poroy station, which is about 20 mins away from Cuzco. You’ll likely need to take a taxi or a local bus. The price for the train is around $96 USD one-way. It will take you directly to Aguas Calientes Station (Machu Picchu Pueblo). Total travel time one-way is around 3.5 hours. Once you arrive to Aguas Calientes, you’ll then need to either hike up to Machu Picchu, or opt for a 40 min, $12 USD bus ride to the top. Unfortunately nothing is really free these days. You’ll need to pay an entrance fee to visit Machu Picchu. The base fee to enter is around $70 USD for adults, and $41 USD for students. Add an extra $10-$15 USD to visit additional places (such as the museum or Huayna Picchu). Machu Pucchu, Cuzco, and Aguas Calientes are quite high in the mountains. If you’re not used to high altitudes, be sure you get accustomed before your trek. Drink Water. Before your trip, and while you are here, drink lots of water. This will help your body adjust more easily to the high altitude. Eat Food High in Potassium. This will help replenish your electrolytes and balance your salt intake. Pack for the Sun. You’re literally closer to the sun. Bring sun screen, a hat, and something to cover your shoulders if exposed. Dress in layers so you can cool off too. Avoid Alcohol. You’re on holiday, drinking comes along with it. Did you know alcohol’s effects will feel stronger in higher altitudes? Watch Your Physical Activity. The air is thinner at higher altitudes. All exercise will feel much more intense. While I have not been to Machu Picchu yet, I’ve done quite a bit of research and have spoken to many travelers who have been. I’ve tried to compile the best resources and suggestions on how to sort out your adventure. If anything doesn’t make sense or is just totally wrong, please tell me in the comments!